There are almost as many kinds of pockets as there are types of garments--patch pockets and inside pockets, in-seam and slashed, lined and unlined. 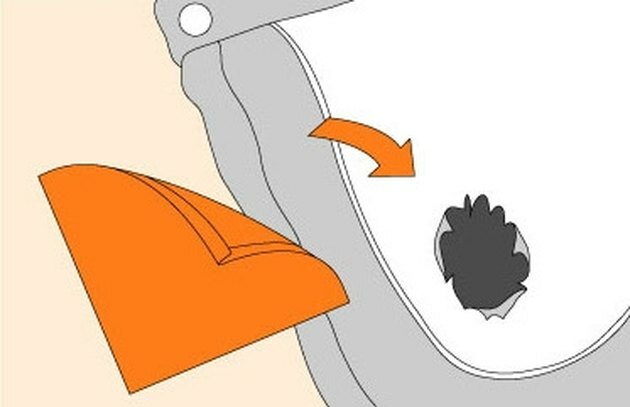 Though each presents slightly different challenges, the following basic techniques will work for almost any pocket that hangs inside the garment. So before you lose any more loose change, try these simple repairs. Turn the pocket inside out. Determine whether the hole was caused by a ripped seam or by a hole in the fabric of the pocket itself. Pick out any bits of loose thread from the split seam. Match the raw edges of the fabric together where the seam is coming apart. Pin the fabric into place. Thread a needle with thread that matches the color of the inside of the pocket. Tie a knot at the end of the thread. Starting 1/2 inch (12 mm) to the right of where the seam is coming apart, begin stitching the fabric together from right to left using a whipstitch (see A): Pull the needle up through both layers of fabric with the needle at a slant, just a few threads from the edge. Loop the needle over the top of the seam to the back side of the fabric. Repeat the whipstitch, making about 15 stitches per inch (2.5 cm), until you've reached the point 1/2 inch (12 mm) to the left of where the seam is coming apart. It won't be pretty, but the whipstitch is strong, and the thread will be hidden inside the pocket when you're done. Tie a knot in the thread, and snip off the thread with scissors. Cut a patch large enough to cover the hole with 3/4 inch (2 cm) extra fabric all around. You can use any fabric of similar weight to the pocket lining. Turn the edges of the patch under 1/4 inch (6 mm), ironing the wrong sides together, so you have a patch that is 1/2 inch (12 mm) larger than the hole on every side (see B). Center the patch over the hole in the pocket, and pin it into place with straight pins. Fold the pocket fabric level with one edge of the patch and whipstitch the edges together, making about 10 to 15 stitches per inch (2.5 cm). 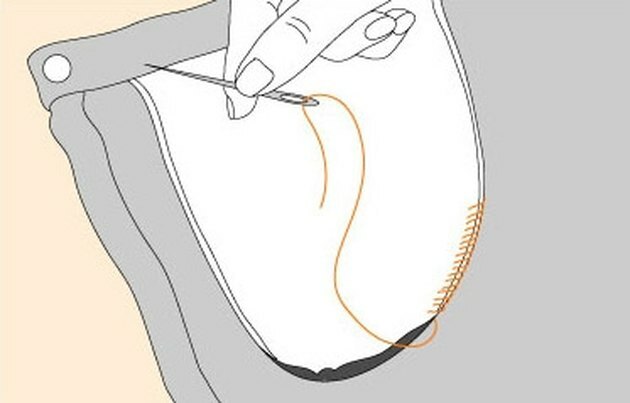 When you reach the corner, refold the pocket fabric and continue stitching the next side, until all sides are stitched. Tie a small knot and snip off the extra thread, close to the knot you just made.